A travel size instrument that sounds like a full size guitar? Impossible! The Cargo is comfortable to play anywhere, from the forests of Oregon to the foothills of the Catskill mountains, and even in your favorite armchair. Finely appointed and incredibly durable, the Cargo is ready when you are. It easily fits airline overheads or anywhere space is tight. 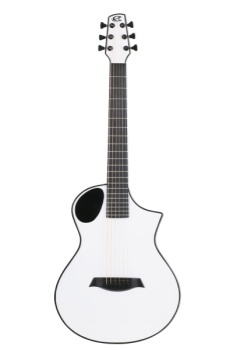 It's a portable guitar with the playability, sound and satisfaction of a full size guitar. Available in high gloss Carbon Burst, Solid Red, Solid Blue, Solid Metallic Charcoal, Solid White or in our Satin Back RAW carbon fiber top finish.